Below is the transcript of an email to Bank of Ireland’s help desk following my discovery this morning that there was no way for me to use their on-line business banking tool (a system for which we pay a monthly premium) without jumping through an extra-ordinary hoop which would be outside the knowledge of most normal users. I have been a business banking customer of Bank of Ireland for the past 7 years. I am also a web developer. As a web developer it is necessary for me to keep up to date with the latest technology to make sure that the websites we build are compatible with as wide a range of technologies as possible. As a result, when Microsoft release an updated version of their browser, Internet Explorer, I install it and am able to continue testing websites across a wide range Internet Explorer versions. With the latest update, Internet Explorer version 10, www.boi-bol.com becomes completely unusable. The login screen will not function in IE10 browser mode, and I have tested it using the compatibility/dev tools functionality to render the site as IE7, 8 or 9. When using it in an earlier rendering mode it allows me to login, however, the new browser window opened to display my business on-line account is, by default, in IE10 mode. When I switch to IE7, 8, or 9, the browser window crashes. If I don’t switch to a different browser version then I can retrieve accounts and select an account from the drop down menu, but as soon as I try to load the Balance or Transactions page the browser window crashes. I have attempted to login via Firefox and Chrome, neither of which work. My laptop is running Windows 8 which comes with Internet Explorer 10 pre-installed. I have attempted to use Business On-Line from this machine but again, nothing I try works. This probably means that no Business On-Line customer using Windows 8 can use the system for which they pay a monthly premium. I cannot believe that we are paying €180 a year to use this system which has clearly not been tested on any modern browsers and is causing me to waste valuable time. My colleague, Donn Maguire (cc’d on this email), has raised this issue in the past, and customer service assured him that a new system will be “rolling out soon” which will address these concerns. Instead absolutely nothing has changed since his first enquiries at least four years ago and we’re still stuck with the identical system which is badly designed, gives a terrible end-user experience, is incompatible with a range of modern browsers, and fails to offer basic functionality which has been available in the personal banking system for a long time. I am now forced to install VirtualBox and run a virtual instance of Windows XP purely to use Business On-Line. This is nothing short of a technological travesty. I blogged about this back in May of this year (inspired by Donn’s last contact with the helpdesk about BOL’s usability issues), and I also intend to publish this communication and update it with any responses. I look forward to hearing what Bank of Ireland are going to do to address this issue. I will make sure to publish their response. I am not overly hopeful of this being resolved any time soon. The system they have implemented feels like a very awkward throwback to the internet of the nineties. I also dread to think what it cost to build. 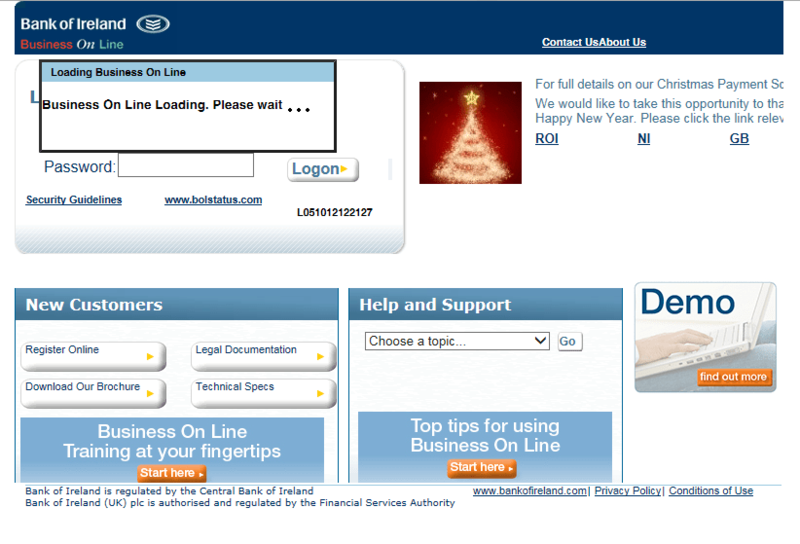 So a Bank of Ireland representative called me the same day I sent the email, back on the 21st December, and then I got distracted by the holiday season. We had a very pleasant and amicable chat (because I’m not good at getting angry at random company reps on the phone). The basic upshot was that it won’t be fixed any time soon. The rep himself uses a Mac and admitted that would mean that he can’t access BOI BOL without BootCamp. My only solution was to continue to use a virtual machine booting Windows XP so that I have access to their system. I let this sit for a while and then wrote a follow-up email which is included below. I have requested that we are no-longer charged for this ‘service’. I am writing this email as a follow up to my previous email which is shown at the end of this message. After my last email I received a phone call from a very pleasant gentleman who explained in detail what the situation was with Bank of Ireland’s Business Online banking system. He explained how Bank of Ireland had hoped to roll out an update which would have addressed these severe shortcomings but have had to delay that work due to various reasons, mainly preparing for the upcoming SEPA changes. He has also added me to a mailing list, at my request, which will send out notifications of upcoming Business Online changes and maintenance work. The conversation was very amicable, but unfortunately we feel that it still does not justify us paying a monthly fee to use a system which is antiquated and requires us to employ time-consuming workarounds to access the system. We have been a customer with Bank of Ireland since starting our business in 2005, pretty much a full 7 years, and I believe we set up Business Online immediately after opening our business account. Therefore we have spent approximately €1,200 to use a system which has seen no updates or changes and does not work as it should. We are unable to access it in modern browsers, it fails to provide detailed information, does not provide tie-ins with modern cloud accounting systems and overall provides us with very little benefit. With this in mind I am formally requesting that we are no longer charged for the use of this system until such time that Bank of Ireland make substantial changes to improve the experience of using this product. Please advise in writing whether this request has been accepted. We are quite happy to pay another bank if they offer a better system, but will remain with Bank of Ireland if the service is offered to us for free. After receiving some comments and some encouraging reactions on Twitter I have followed up with an additional email to Bank of Ireland. I am disappointed to have not received a reply to my email sent four days ago requesting the immediate cessation of charges for the Business On-Line service. I am continuing to update my personal blog with this correspondence and both blog posts I have written on this subject are starting to receive additional comments and are gaining traction on Twitter through retweets and replies. Below are some links that might be of interest. Please confirm, in writing, whether we can expect the removal of Business OnLine charges from our account. @alexleonard It’s a disgrace that the latest browsers are not supported. Woeful support from BOI as usual. Change bank. @alexleonard its completely insane and yet so typically Irish too!! Beyond poor not supporting Mac/IOS devices by now!